This church, built in 1916, has been extended twice but maintains its original style. The architect was Frederick de Jersey Clere and the builder Albert H. Mildenhall. The wife of the first minister, Rev William H Walton, nursed in a temporary hospital at the church in the 1918 influenza epidemic. By 1908, Plimmerton had about 100 permanent residents and many more weekend visitors. 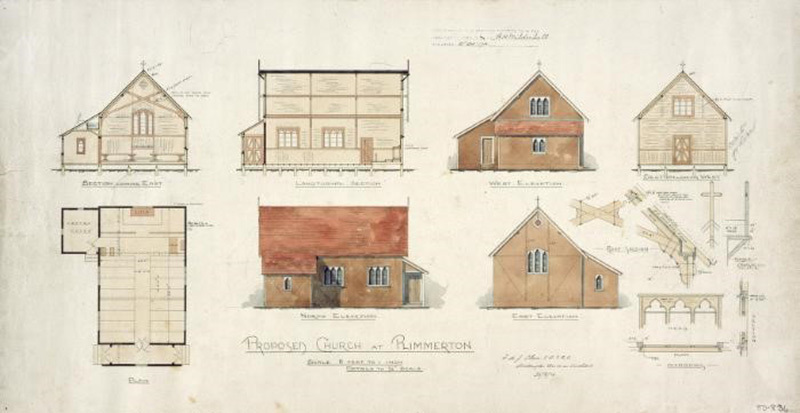 The nearest Anglican Church was St Alban’s in Pauatahanui and, with interest mounting in building a local church, the diocese in 1916 bought this section from the Plimmer Estate for £52. The architect to the diocese, Frederick de Jersey Clere, designed the church and local builder, Albert H. Mildenhall, completed the building that year at a cost of £310. Fronted by a picket fence with a small lychgate from the street, it was dedicated as a ‘church room’ rather than a church on Christmas Eve 1916. Being by the sea it was named for the disciple Andrew the fisherman. Before the church was built, services for both Anglican and Catholic congregations were held in the small school building on the eastern side of the railway line. Once St Andrew’s was built, Catholics occasionally also used it for services until St Theresa’s was built in 1931. The first Minister (1916-1919) was William Henry Walton who came to New Zealand in 1904 as a Church Army missioner for the slum area in St Peter’s Parish in Wellington – the start of the Wellington City Mission. He was ordained deacon in 1912, then priest in 1915. His parish in 1916 covered the area from Pukerua Bay to Glenside with centres at Plimmerton, Pahautanui (now Pauatahanui), Porirua and Paramattta (now Paremata). In 1919 he left to take up the chaplaincy at the Porirua Mental Hospital. During the 1918 Spanish influenza epidemic, the church became the main local hospital where Ethel Walton, wife of the minister, was a nurse. 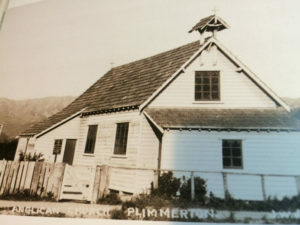 In the late 1950s, the church facilities were improved and expanded to better serve the now large suburban area of Plimmerton. A new chancel and sanctuary were added in 1963, providing sufficient facilities to elevate the building to church status. In 1971 it was formally consecrated as St. Andrew’s, Plimmerton. The church has undergone a number of changes and most recently required significant rebuilding because of a fire. However, the street view has largely maintained the original style, with more openness and light in the interior. In 1929, an adjoining shop became a church hall which was extended in 1951. The community has made good use of the hall; the Post Office leased the building for two years while waiting for new premises. A covered passage, completed in 1967, connects the hall to the church. The hall was replaced in 2004, along with significant modifications to the linking structure to the church. The first vicarage was in Beach Road from 1927, and later moved to Paremata. The church website has more of the history, together with descriptions of various items donated by parishioners over the years. This includes the beautiful stained glass window dedicated to the life of Ian Turner. Olaf Wehr-Candler created it from his design linking Andrew, the fisherman, disciple, and Patron Saint of Scotland, to St Andrew’s church and our local environment at Plimmerton. Private communication from Brian Walton, son of William Henry Walton.